Portsmouth, RI — The Hinckley Company today announced that Pete Saladino has joined the company in the newly created role of Chief Marketing Officer. 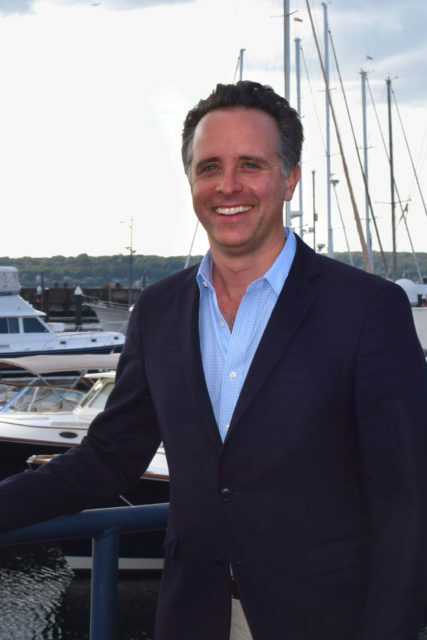 Based in Portsmouth, Saladino will lead all marketing efforts globally as Hinckley continues to expand its line up of premium yachts and its yacht services business. Saladino brings extensive experience marketing premium, innovative products following 13 years with Samsung’s Galaxy brand of smartphones in the United States and in Asia. “Pete is arriving at Hinckley at a particularly exciting time” said Peter O’Connell, president and CEO of The Hinckley Company. “We have strong momentum in new yacht sales and in our yacht services business. We are also poised to announce some groundbreaking new products this fall which Pete will be instrumental in bringing to market. We continue to expand our services offering with a larger footprint in Southwest Harbor, Maine and a new location in Stamford, Connecticut. It’s a great time for Pete to join the team” said O’Connell. At Samsung, Saladino built the marketing platform for national consumer programs for the Galaxy S7 and Galaxy S8 launches in the US. Prior to that, Saladino led marketing efforts with Samsung’s largest customer in the US. He has extensive experience as a leader on projects internationally in markets as diverse as Japan, Hong Kong, Russia and Korea. Saladino holds an MBA from Columbia Business School and a BS in Engineering from Cornell University. Saladino grew up sailing on Long Island Sound and was co-captain of the dinghy racing team at Cornell. He fell in love with a flag blue Hinckley 38 while driving launch in high school and has a long history with the Hinckley brand. He has owned a 1967 Hinckley Pilot 35, Ragamuffin, sailed out of Larchmont, New York for over 13 years and took her through a refit at Hinckley Yacht Services in Southwest Harbor in 2010. “I am delighted to join the team at Hinckley and to work on one of the most distinguished brands in yachting” said Saladino. Saladino is married with two children and will be relocating to the Portsmouth area.